Has 22 recipes, 15 public recipes. Has 137 flavors in inventory. Silky supports All The Flavors. Upgrade yourself. Graham Crackers and Custard are a match made in heaven. There are countless versions of this dynamic duo, but this one is mine. I'm very happy with how this turned out, and after many, MANY versions, this is the one I keep coming back to. We've got rich vanilla custard with cinnamon and subtle notes of caramelized brown sugar and honey. Then come in the crunchy cookie graham crackers. Thick and dense, these two partners make one hell of a team. The profile is simple for the most part, but I had a blast working in different concentrates to really fill this vape out into something I'm quite proud of. Most of these flavors you will find carry a dark sweetness that I am very fond of, and I think it helps fit the theme nicely. I really like bending bakeries. I could never seem to get graham cracker right, though. I tried so many graham cracker combinations and they all fell short. I could never get that crunch that I wanted. I needed that texture. So I decided to invite FA Cookie to the party. This is a beast of a concentrate when you want that AP heavy crunch. It's kind of dry, but we are dropping those Graham Crackers into custard, right? FA Cookie is a crunchy bakery 'cookie’ base that works very well to build our graham cracker off of. It's definitely AP heavy, and works well as a jump-off point because of its graininess and neutrality. It's dark, and mildly sweet, kind of like my Irish mother. That's our foundation, folks. Let's start building that bad Larry up. I used two graham crackers in conjunction to the FA Cookie, both serving very different purposes. CAP Graham Cracker brings the cinnamon, and FW Graham Cracker brings some more crunch, with a touch honey. CAP Graham Cracker has a decently strong bakery cinnamon sweetness, some people find it off-putting, but I personally love it once it settles down a bit. You are going to get some butter, and a slight graininess from this concentrate which is helpful to build on that cookie base. This thang tastes pretty authentic to me, almost like they were homemade and baked. These graham crackers came out of the oven, not out of a box. This concentrate needs help in the crunch department, and that's why we are also using FA Cookie and FW Graham Cracker. FW Graham Cracker is hands down my favorite GC. If I had to only pick one, this is it. You ever had Honey Maid Graham Crackers? You know, the ones that come in sheets and you have to break apart? These are them. Definitely sweet, definitely cookie-like, and it packs that punchy crunchy. It also brings some honey, which is awesome in combination with CAP's offering. These 3 bakeries working together create our graham cracker cookie. It's tasty, and in my opinion a very clear representation of a solid graham cracker to crumble up into our custard. Custard is so bomb. They are easily my favorite profile and I absolutely love tinkering with new ways to elevate them. This custard base seems pretty standard, but each ingredient was chosen very deliberately to help bolster our graham cracker. Let's start with the custard base, no surprise here, CAP Vanilla Custard. CAP Vanilla Custard is universally accepted as a solid canvas to paint upon when it comes to developing a custard recipe, and there is no exception here. It's eggy. It's rich and buttery. It's thick, creamy and sweet. I didn't want to bring it too high, because that depth and intrigue was going to come from our cream and vanilla addition. I like taking a custard and accentuating it with the proper cream, and the proper vanilla. It just works. DIYFS Holy Vanilla found it's home here because I decided I wanted to keep things dark. It's a superb vanilla. Malty and creamy with a tad of spice that leans towards extract. Crack them beans, baby. 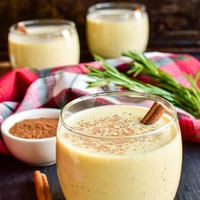 The rich vanilla sinks into the custard and thickens it up, all while bringing a maltiness that plays off not only the custard base, but the graham cracker. It helps bring dimension and clarity to the graham cracker which helps deliver a more accurate end product. Nothing too out of the box with this one, it just fits. INW Creme Brulee is what sets this custard apart for me. I mean honestly, this is just another custard, but it has this delectable brown sugar note accompanied by creamy vanilla. It's not quite burnt but more of a bubbly caramelization of sugar. It again, not only brings depth to our custard, but our graham cracker as well. Brown sugar and custard? Sign me up. Sticky brown sugar graham crackers in a delicious vanilla custard? Put me in coach. And there you have it. Crunchy, crumbly graham crackers and a robust vanilla custard sure to satisfy you bakery heads like me. Hope you enjoy. 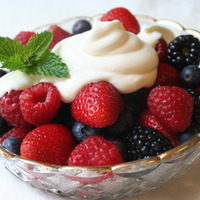 Juicy berries blended with a thick cream, sure to tantalize your taste buds. 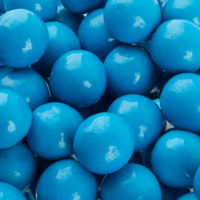 Sour Blue Raspberry Bubble Gum. Bubblegum from FLV is stellar. Blue Raspberry LB + Blueberry HS is a great combo for a solid blue raspberry candy. Lemon Mix to make the berries pop, and add some more sour and tartness. Sour Apple from FLV brings some tartness. Candy Wizard from FA is a nice texturizer, brings some sweetness, and drives home the candy profile. 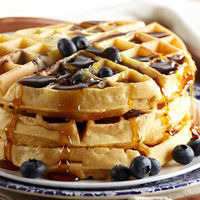 Waffles. With Blueberries. Morning breakfast for all you early risers! County Fair, bourbon glazed pecans. Bourbon Block. Like I stated before, I've been really enjoying the combination of TFA Kentucky Bourbon + FLV Bourbon. Together these guys create a deliciously rich and smokey, sweet blended bourbon flavor. 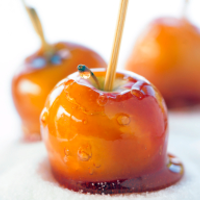 It really works excellently as our glaze in combination with with our “sticky” ingredients. Glaze Block. VT Golden Syrup + TFA Toasted Marshmallow. We all know and love the wonders of Kentucky Bourbon and Toasted Marshmallow thanks to /u/coop34 . Toasted Marshmallow helps “char” that bourbon and brings smoky sweetness to our glaze along with mouth feel. Golden Syrup makes things stickier and thicker, and also helps elevate our sweetness. 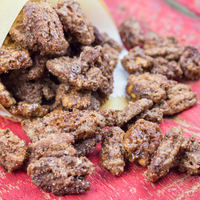 It acts as a binder for our cinnamon to create those crunchy cinnamon sweet clusters we find covering our pecans. Cinnamon Block. FLV Rich Cinnamon. If a recipe calls for cinnamon, 99% of the time I'm using this. It's an unparalleled bakery cinnamon that is sweet and potent. Pecan Block. FW Butter Pecan. Another concentrate I consider best in class is this one. It's smooth and buttery, it almost has a warm taste. It's decadent and dense and nutty. This is what we attach all of our blocks too. Bourbon and Cinnamon to glaze, and the glaze to the pecans. That's about it. It can be SnV'd but solidifies over about a week. In my opinion this is pretty straightforward, and reminds me of those bags of pecans you get from the little carts at your local County Fair. Enjoy! In my home city we have a very eclectic group of people. It's legitimately a melting pot of all cultures. I was fortunate enough to be exposed to all sorts of different foods growing up, and one of my favorite things to do was to go to different ethnic grocery stores with my mother. There was one store in particular that always had me very excited, and it wasn't really a store. It was basically a giant warehouse, with tons of different little shops smashed into it. This place was called Mitsuwa. A Japaense Marketplace. Particulary, my favorite place in the market was the candy aisle. I could not read japanese but the packaging was brilliant. It was a surprise every time I chose something new. 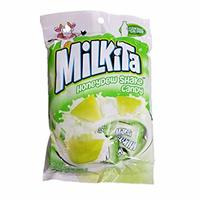 My absolute, hands down, favorite candy of all time from Mitsuwa, was a Honeydew Shake Candy called Milkita. It was almost like a Honeydew Taffy, emphasis on the milk. Here is my rendition of it, which I am happy to say has exceeded my expectations in wanting to re-create that nostalgic taste. JF Honeydew Melon - Pretty much the standard when it comes to delicious Honeydew Melon flavors. They knocked it out of the park with this one. It's a sweet and fresh melon flavor thats pretty potent too. It does mellow out over time, so thats why I accented it with the even more potent TFA Honeydew. In conjunction with eachother these two really drive home that sweet, green, melon flavor that so reminds me of those little chewy Milkita candies. I also get a creaminess out of these two, as I do with most melon flavors, which plays nicely with our other ingredients and overall goal for the recipe. FLV Cantaloupe - This stuff tastes fairly authentic to me. Its a natural, ripe, sweet cantaloupe that plays right into the melon profile and helps accentuate the body of that fruity creaminess. FA Coconut - This was what I was missing from my earliest versions. Just a touch here helps bring some more milkiness, pumps up the sweetness level, and acts as a bridge between the fruits and creams. I was super excited when I started using this and it worked so well. FLV Cream - Bring on the creaminess. This has a dairy taste, but not as agressive as FA Fresh Cream or ooo Cream - Milky Undertones. I was originally using TFA Marshmallow to bring some body and sweetness, but it seemed overbearing. 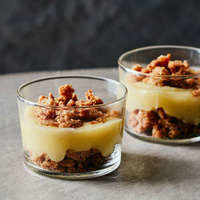 FLV Cream brought some great body, mouthfeel, a reasonable amount of dairy, and also helped the richness of the recipe. Its thick. More like a heavy whipping cream than a milk that plays well with the fruits. ooo Cream - Milky Undertones - This is flavoring has been a godsend. It's milk with a touch of sweetness. No-nonsense here. Its fluffy, which helps emulate the candy aspect of the source material and worked exactly as intended. FA Meringue - Sugary sprinkled sweetness. Helps in the cream department making things milkier, helps in the sweetness department delivering that accurate candy profile. 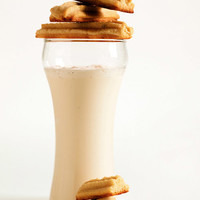 A no-nonsense Malted Vanilla Milkshake with shortbread biscuit crumbles. Hope you all enjoy! I've been delving into tobacco's. So far I have no idea what I'm doing. But, one thing I do know pretty well is desserts. So I figured I would start with the most non intrusive tobacco I could think of. RY4. I eye Holy Grail RY4 by DIYFS every time I re-up on Holy Vanilla or see mentions of Cardinal, and I finally bit the bullet a few weeks ago. Here is my first tobacco recipe that I can say is super tasty. Holy Grail RY4 as I'm sure most of you know, is thick and creamy. Delicious sweet tones of caramel and vanilla really serve as the backbone for this recipe. It has a touch of tobacco that peaks out every now and again that plays well with others. 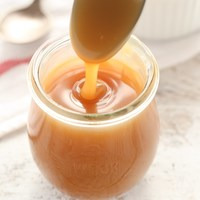 I was actually surprised at how much I enjoyed this concentrate, I can see it serving as a main caramel note with out much fuss in tons of other recipes. I will definitely be keeping this stocked! This combo has never steered me wrong. I first saw it used in Leche de Coco. FA Coconut is a nice creamy coconut, much like the meaty part of the fruit, that serves as an accent to our main coconut note. This stuff is super tasty and finds it's way into a lot of my recipes when I want a little nuance and added creaminess. FLV Sweet Coconut is hands down my favorite coconut flavoring. It's an amazing start to any recipe where you want a milky and smooth coconut taste. It almost gives off a coconut candy vibe, but really meshes well with caramel to add some silkiness and vibrance. Coconuts and caramel are a match made in heaven. Body time. I think I use FW Graham Cracker too much. It's my favorite GC for sure. It's crunchy and buttery. It has some honey. It tastes cookie-like, and after a nice long steep it has some coconut tones. Seemed like a no brainer. I wanted to keep this recipe simple. It ended up being far more complex taste wise than I anticipated. It's like a graham cracker dipped in milky, coconut infused caramel. Sometimes I get the tobacco. Sometimes not. Either way it's staying in my rotation, a definite winner in my book. Enjoy! After feedback and testing I have changed FW Graham Cracker from 2% to 3%. My friends and I all really enjoyed this recipe. Very well balanced and delicious. Absolutely delicious. Eisai tea is the perfect matcha/green tea flavor for this profile! I've been using this white chocolate base for ages. It's awesome. Knocked it out of the park with this one Dave. Killer remix. Thanks for letting me taste test it!